Discussion in 'Jazz Newz' started by Taylor Griffin, Dec 6, 2018. Kyle Korver made his return to Salt Lake City the other night, and Jazz fans welcomed him back with open arms. Salt Lake City welcomes back Kyle Korver to the @utahjazz! There’s something special about seeing a player return to a city and team. The nostalgia is thick as you remember moments you shared with the players, the feelings you had as a younger fan, and the memories of old uniforms and color combos. Watching Korver get an ovation from the crowd as he checked in took me back to watching him splash threes in the powder blue unis of the late 2000’s. His tall socks and shaggy hair, man what a time. Seeing him return to SLC and pick up where he left off was pretty awesome. Know what was even cooler? Korver’s buckets that came afterwards. Korver seems to be just what the doctor ordered, and more. It’s no coincidence that just three games after trading for him, the Jazz broke the franchise record for threes made in a game. 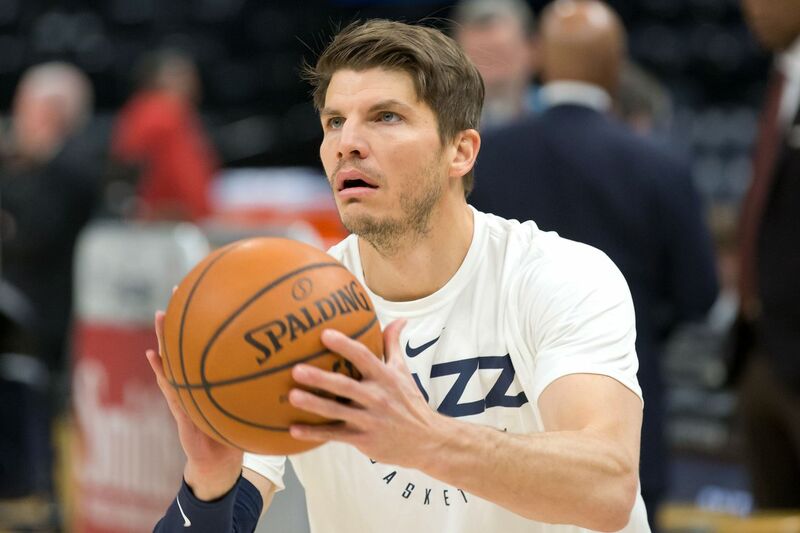 Korver is an elite shooter, one of the best of all time, and it’s great to have him back in a Jazz uniform again. His post-game interview following his 15-point performance in Tuesday night’s victory over the Spurs made it sound like the feelings were pretty mutual as far as Korver’s fit in the organization. It’s hard not to smile as you watch this. You can really tell that Korver is genuinely happy that he’s back in Utah. I hope there’s many more post-game interviews like this one, Gatorade showers included. One of the most surprising elements of Donovan Mitchell’s breakout rookie season last year was his ability to swoon the superstars of the NBA. You saw it last year with guys like LeBron James, Chris Paul, Russell Westbook, Paul George, the list goes on and on. A year has past, and Donovan is still deepening his relationship with those megastars. We saw it the other night after the Heat game when Mitchell and Dwyane Wade exchanged jerseys. With the Houston Rockets in town, Chris Paul and James Harden also shared their thoughts on Donovan Mitchell, and what type of a player they believe him to be. Chris Paul on Donovan Mitchell: "He’s like a little brother to me, man. I talk to Donovan often, all the time." James Harden on Donovan Mitchell: "This year there’s a lot more expectation on him, and I think he’s handled it extremely well. He's very humble. He’s still young, but he handles himself very well. Very mature. He just worries about basketball and taking care of his family." It’s pretty cool to see NBA superstars talking about a player on the Utah Jazz like that. It’s something pretty foreign for the organization, which is why Donovan Mitchell is such an asset to the Utah Jazz family and fan base. Chris Paul saying he talks to Mitchell “all the time” is a good sign that Mitchell is actively communicating with these guys, picking their brains, and hopefully learning from their greatness. It’s too bad that Paul is going to have to get smoked by his “little brother” tonight on the hardwood though. One of the most frustrating things about the Jazz this season is their inconsistency in starting games off. It seems like far too often they start out in a 2-8 hole, and have to slowly dig their way out of the deficit as they go. What’s the deal with the slow starts? May say it’s due to the lineup that Quin Snyder starts out with and lack of spacing with both Gobert and Favors on the floor. But if you ask Ricky Rubio? I’m not exactly sure what Ricky is trying to say here. He acknowledges the fact that he has heard people talking about slow starts to games. But in a way, dismisses it by saying he’s getting sick of hearing about it. It sounds like the Jazz know that they need to start games stronger, and are working their best to fix it. As Ricky said “There is nobody more hard on us than ourselves”. To that, I have to say I don’t know if I can agree with you Rick, Twitter has been pretty hard on you guys for the way games have been started. Recent games however have shown great signs of improvements and hopefully the Jazz can return to playing complete winning basketball games. Speaking of Ricky Rubio, he is kind of on a mini-tear right now. I mean, he’s not scoring 30 points a night (not yet anyways), but Rubio has improved drastically since the beginning of season, hopefully to stay there and remain consistent. Ricky Rubio's TS% right now (.515) is better than his career TS% (.510). The Jazz are a +6.4 NetRtg with Rubio on the floor during that stretch, but a minus-10.0 when he sits. I truly believe that Ricky Rubio is the most important player to this Jazz team’s success. When he plays poorly, the Jazz usually lose. When he plays well, the Jazz usually win. He has such an impact on the game with the way he runs the offense and gets the Jazz into their sets. He also has a different energy to him that passes on to the other players on floor with him. If he can continue to stay consistent with his shooting and decision making, it will not be long before the Jazz are back in the playoff standings. Grayson Allen had another strong showing in his G-league minutes Wendesday night, with 14 points, 3 rebounds, and 3 assists. It’s not exactly a great sign having to send your first-round pick to the G-League, but Allen shows that he has the tools to be an NBA-level player for sure. He wasn’t able to make the most of his minutes yet in games appeared this season, but if he keeps at it he will soon be able to prove whether or not he belongs in the league.